I love to share with those who are passionate about their gardens. Please, like me. :) Visit, comment, and all that other stuff. Went to the Green Expo in Minneapolis this last month. It always gets me charged up for a new year of landscape design. This time, it's all kinds of new plants. Can you possibly improve on a Hydrangea anymore? Yes, apparently. Check out Vanilla Strawberry Hydrangea and the gorgeous pink blooms. This is one for your garden and for your table. Lately, I'm a bit obsessed. My garden of the past few years is starting to come into it's own (despite my plans to start over). Along the way, some beautiful plant combinations have poked their heads up. I have even found myself moving annuals at the nursery so they show off their colors better. Obsessed? A bit. 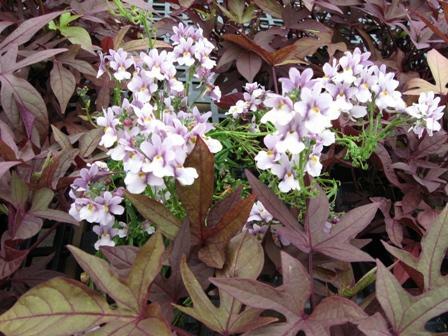 This picture is Ipomoea batatas 'Sweet Caroline Bronze' and Nemesia fruticans 'Aromatica Violet Ice'. They're gorgeous together! 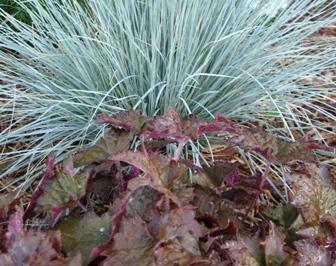 Blue Oat grass -- have you noticed how many plants it looks great with? This picture shows it with Heuchera, but I also love it with May Night Salvia. 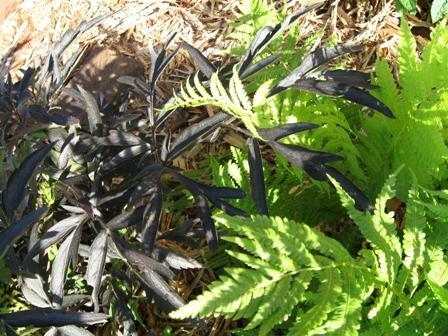 This picture could be better, but the cool green of the fern with the Black Lace Elderberry are mingling beautifully. This is on the East side of the house which probably explains why my fern is not toast. 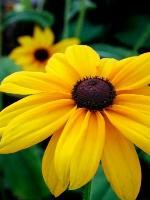 So, WHY do plant combinations matter? Why not show off your best plant with the best combination? If you love a red, red, rose, plant it poking out of Blue Oat grass or in front of a deep green yew. Taking the time to put plants together that really show each other off -- it's fun! In fact, when I shop for my containers in the spring, that's exactly what I do. Grab a begonia and walk around to see what really looks good with it. Anyone else have some great plant combinations -- let me know! My favorite way to make a garden green (er) -- is with native plants and natural materials. This is a great style -- adaptable to any area. Check out your local materials and research some local plants. In Wisconsin, we've got lots of woodlands, prairies, rolling hills and farmland. Set off your 'natural' garden with wood. Wood tile and furniture -- even wood fencing and wood edging are a great choice in our area. Finally, consider some traditional plants. These would be plants that aren't native, but have been in the area a long time -- the ones that remind you of grandma's farm. Lilacs and apple trees are my favs here. Remember to have a design plan and have fun. This is a design style that will leave you smiling. One of my favorite things to do is to cut flowers for vases in my home. If I can get a plant that not only looks good outside, but inside -- perfect. 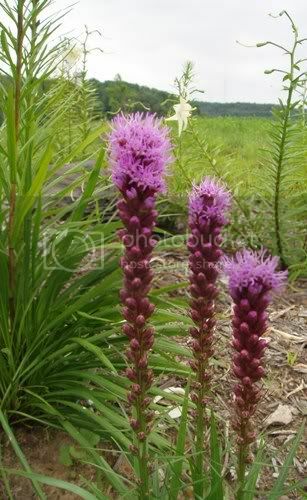 Recently the Liatris were blooming on the corner of the house. As a native Wisconsin plant, I've always liked it for the lovely spikes of purple. So, I couldn't resist. I cut one for a vase next to my bathroom mirror. Wow. I couldn't believe the look. Stuck in a little bud vase all by itself, Liatris is a beautiful and unusual flower. Very modern looking -- I'm sure that with a larger arrangement it would work equally well. 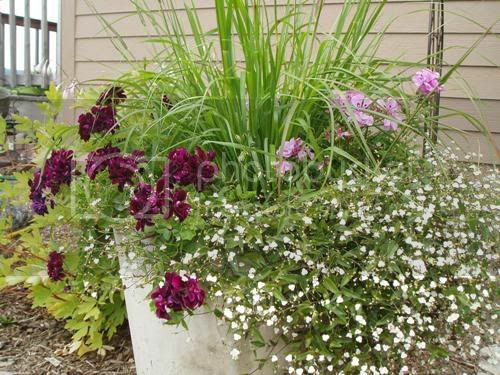 Container gardens can sometimes be hit or miss. My best tips for these? Shop for all of the plants at the same time -- preferably at the same nursery, too. This year, my container garden design has rewarded me with beautiful blooms -- and I've hardly had to do a thing to it (except for the spring panic). 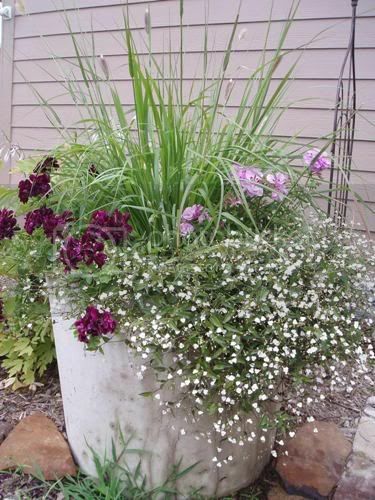 I live in northern Wisconsin, so when I shop for containers I like to see concrete or iron. 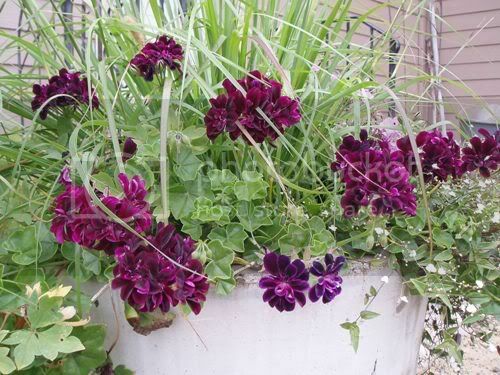 Why spend oodles on clay pots when I want them to stay outside for more than 5-6 months? Plus, I usually forget to bring in clay pots and they just get ruined. I remember the ivy geranium -- the dark one -- is called Black Magic. Enchanting. :) The grass has little plumes that actually have a dusting of the dark purple, too. Contrast that with the other geranium and the bridal veil (I think that's what it is) and I'm hooked. Oh, and the spring panic? My containers weren't draining very well at all. Had to have an emergency surgery -- got out the concrete drill and voila! Drainage. It's definitely an important step for concrete containers when you'll have freezing winters, too. Here's a 'happy accident' that I am fond of. 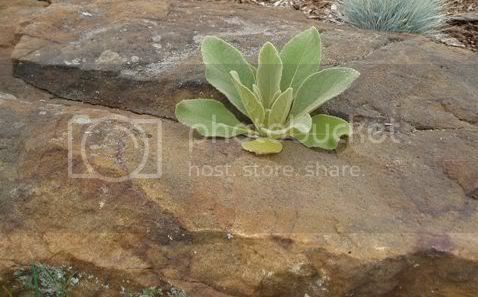 Lamb's ear grew into the seating rock in our garden. The textures next to each other is great. I love roses, but like many people I really don't have the time to fuss over them. That's why landscape roses and shrub roses are so awesome. If you're busy with family and friends, work, housekeeping and all that other 'stuff' that gets into our daily schedules, try some easy-care shrub roses. One rose that I've decided is definitely worth a try: Meidiland. I was almost going to try Ruby Meidiland, but decided it was too close to true red for the design I'm working on (which is using blue-reds). Nevertheless -- Wow! Instead, I'm using Magic Meidiland in the French garden that I'm designing now. A classic plant, roses are hard to resist. My client's guests are going to ooooo and aaahhh over these roses which are really pretty easy to care for. Stunning. Deck design? Doesn't that take some fancy software? *materials -- cedar, composite, green-treated? *layout Is there room for your furniture and the grill? *railing and spindles Have some fun with it! *function Built in countertop or bench? -- great for entertaining! *lighting -- works great for all those summer parties. *built-ins -- Think hot tub, planters, you name it. Hey, more on deck design at my website...with pictures! Patios, outdoor livingrooms, outdoor kitchens -- you love to spend your time outdoors. "Up North", we crave the outdoors. Our growing season, alas, is short, so when it's warm you'll find us enjoying every minute of it. Some of my favorite patio designs have been with pavers. There are great colors and shapes -- tumbled bricks that look like aged cobblestone. Now, however, there's a new kid on the block. Stone tile. Cut stone has been around. Locally, we have a lovely cut limestone -- but to get enough to install a good size patio could get pretty hard on the budget. The newest concrete pavers in our area are made to look like stone tile. Slate, limestone, or travertine, I've seen them up close and love the texture. They're still an investment... coming in well above your entry-level paver patio. Has anyone tried these? What are your thoughts on the look?